So tonight, this pumpkin ended up being something way more than this, but I’m kinda glad I photographed it simple with just the black Helvetica vinyl stickers. I bought the stickers at Michaels and just stuck them on. It sometimes is so simple to make a big impact. It really doesn’t take much! You could do this idea with a variety of other stickers. I like the simplicity of this sans-serif font, but that’s me. And I guess it looks kinda Halloweenish, but I’ve seen a lot of simple black and white décor that you can incorporate into your home. It just looks more graphic and bold rather than super fallish. Also, I am all about non-traditional holiday looks. I love seeking out alternative color palettes! I plan on sharing what this evolved into in a day or two! P.S. I added my project here! Absolutely ADORE your blog! Can I feature you on I Heart Fresno? oh this is sensational!!! I love love love it!!!! This is fantastic – LOVE it! Wow! I love it!! That is so fun and different! Thanks all! I kinda wish I had left it that way, but I distressed the pumpkins even more after this. 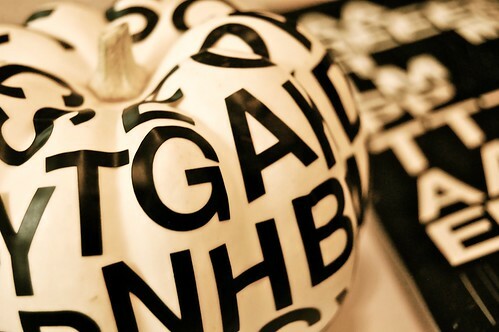 Need to go buy more mini white pumpkins to do this too! You have the cutest ideas! 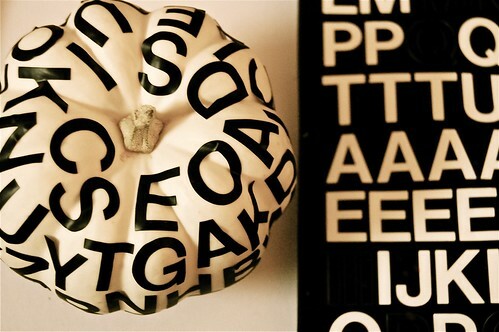 Love the letters on the pumpkin!!! I’m crazy about black and white…this is perfect!! !